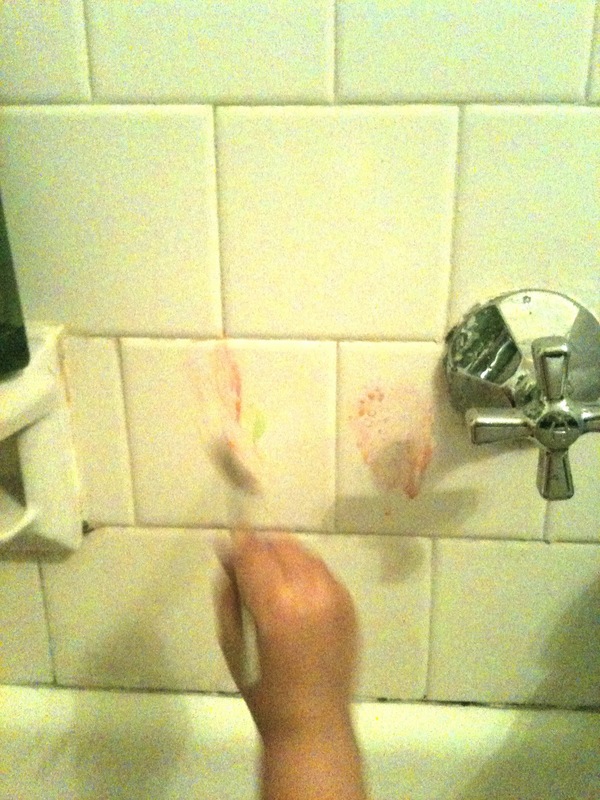 A few months ago we made some bath tub crayons and while they worked, they were not making the bathtub masterpieces I had hoped. Recently The Bee has been playing with a paint brush and foam paint roller in the bathtub. She loves painting the water on the walls and sides of the bathtub. Yesterday watching her do this made me think, how fun would it be if I could make some real bathtub paints for her. I went back to the bathtub crayons and thought what if they were liquid. I poured some clear Method hand soap (but you could probably use any clear soap, even a shampoo) into small plastic containers. Next I added a few drops of food coloring to each container. I then showed The Bee the new bathtub paints, she was so excited! The paints are actually very beautiful, and remind me of watercolors the way the colors blend together. She loved painting on the wall, tub and even her own arms. I loved that we just rinsed everything off at the end of the bath. I should add that I tested the paints out on our tub first just to make sure it didn't stain, I always worry that food coloring will stain. Especially an old tub like ours, but that hasn't been a problem.